Never Enough Nails: Lynnderella Friday, Vol. 11! I have a smaller, but still so sparkly, Lynnderella Friday post for you today! This has been a rough week, just getting back into the swing of things after the summer! Lynnderella Tiger Heart is definitely cheering me up though. Tiger Heart is a very special Lynnderella because it was "created to benefit The Wild Animal Sanctuary in Keenesburg, Colorado. The charity’s mission is to rescue and care for abandoned and abused lions, tigers, bears and other exotic animals that have been confiscated by law enforcement agencies from illegal situations". This is a cause near and dear to me- I am a huge lover of animals, especially big cats. 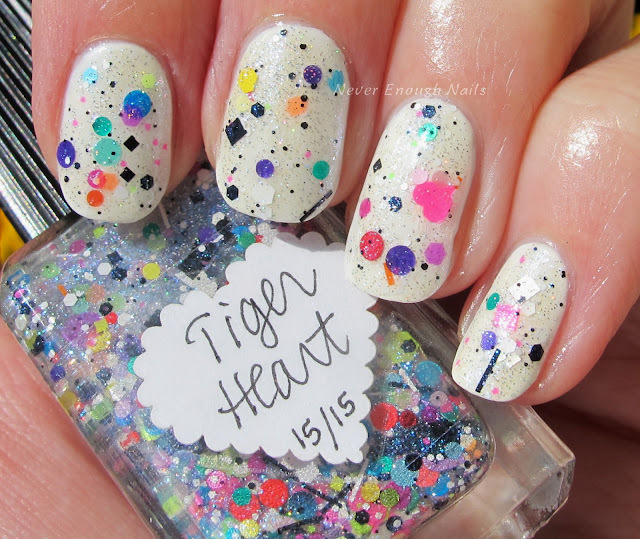 Not only does Tiger Heart support a great cause, but it is also a striking assortment of bright rainbow-colored glitters in all shapes and sizes. 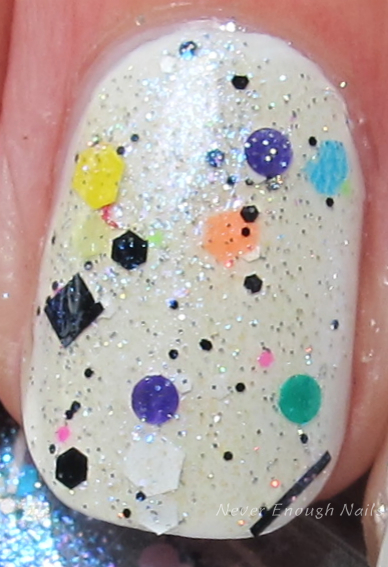 The rainbow glitters are paired nicely with black and white accents and silver holo microglitter. I used a white base for this mani (OPI Non-Stop White) to really show off the range of colors in this polish. This is just one dabbed coat of Tiger Heart, the glitter is plentiful. It was easy to apply and had a great consistency. 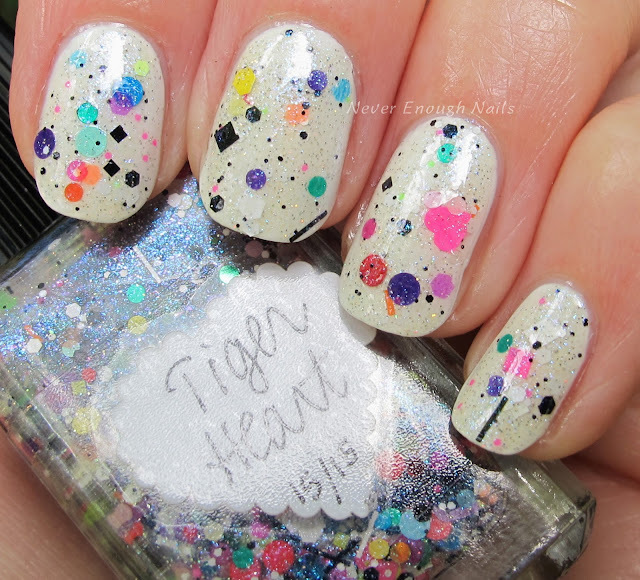 I'd love to wear Tiger Heart over a bright neon pink next for a totally 80's feel! Next up is a polish I've been meaning to get for ages, but I just picked it up in Lynnderella's first ever Warehouse Sale (LOVED this sale!). 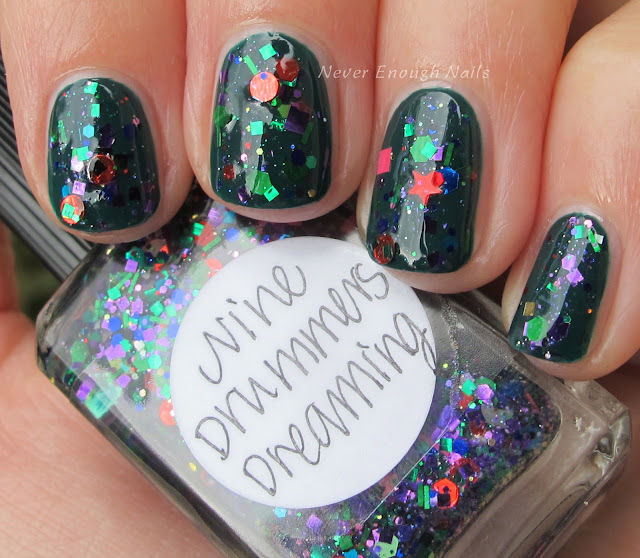 Lynnderella Nine Drummers Dreaming is a core polish from the Twelve Days of Christmas collection, but it works very well for fall too. 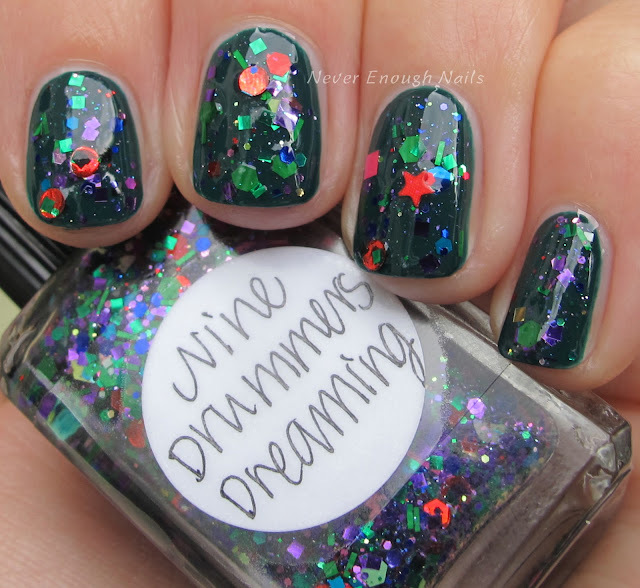 Nine Drummers Dreaming has purple, red and green metallic glitters with some gold and white accents in a purple shimmered clear base. 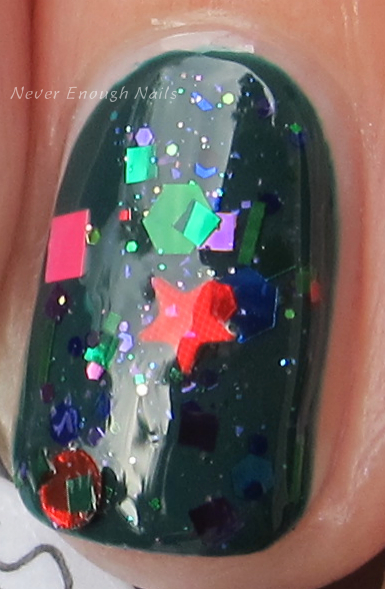 It really looks Christmas-y on top of this dark green base, but I am OK with that cause 97 days til Christmas!!!! This is one dabbed coat of Nine Drummers Dreaming over Barielle Born 2 B Naughty. It had a great formula and applied very easily. I am so happy I finally got this and can't wait to wear it at Christmas time! Tiger Heart and Nine Drummers Dreaming are available on lynnderella.com. Lynnderellas are also available on lynnderella.storenvy.com.